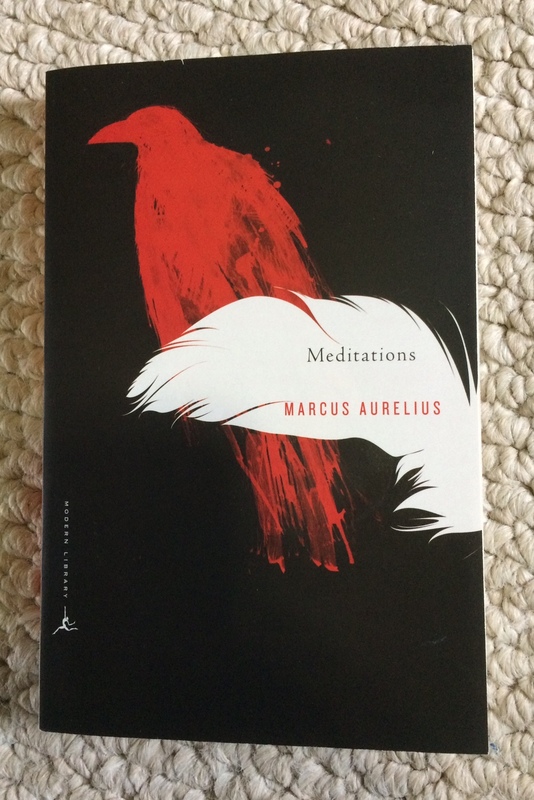 Meditations, written by Marcus Aurelius almost two thousand years ago, is one of the Great Works of Western Literature (and I capitalized that, so you know it’s serious). It’s a fairly short book with no narrative or overall structure, just a series of little notes — scraps of philosophy, bits of advice, quotations, observations — about how to live a virtuous life. Countless readers over the centuries have relied on its wisdom. And it sat on my shelf for many months, unopened and unloved. One of the few pleasant side effects of airplane travel is getting time to read. On the way down to New Orleans last Saturday, I read Meditations start to finish in just a few hours. The author never meant for it to be published. Even the title was added much later, by someone else. In fact, by all indications, Marcus Aurelius never meant for anyone besides himself to read these notes. They are for his own use and his own betterment. The rough, personal nature of the writing explains some of its quirks — for instance, why it seems so disorganized. And, above all, why it’s so extremely repetitive. Don’t seek pleasure. Don’t avoid pain. If you’re in pain, even intense pain, just ignore it. Life is short. You’re going to die. Everything changes. Man up and get on with it. Don’t worry about what anyone thinks of you. If they hate you, screw ’em. If they love you, well, they’re gonna die sooner or later. Expect nothing from other people and you won’t be disappointed. Be nice to everyone. Everything you do should be for the common good. Avoid books, art, music, and philosophy, except to the extent that they help you reach your selfless goals. See things for what they really are. Don’t get starstruck or sentimental. Even the purple Imperial robes are just sheep hair dipped in shellfish guts. History’s a big cycle, the same things happening again and again, with just the names changed. You think you’re special? You’re not special. To be like the rock that the waves keep crashing over. It stands unmoved and the raging of the sea falls still around it. For me, the book was an odd mix of depressing, inspiring, illogical, and wise. There’s a lot to criticize about this kind of thinking. For starters, it’s not very practical. Saying “Ignore pain” is easy enough, but standing up to actual pain in real life is a lot more likely to succeed if you have a strategy. What’s more, such demanding all-or-nothing standards can leave you rudderless when you fail to meet them — as you inevitably will, over and over. For me, self-discipline works a lot better when I ask not only “How can I make sure I do this?” but also “What will I do when I fail?” Such notions find little traction in this book. I think there’s a logical gap, too. It seems inconsistent to me when you say “It doesn’t matter if I die, it doesn’t matter if I feel pain, everything around you will soon be gone,” but then also, “Devote your life to helping others because that’s all that matters.” Why do their lives matter so much, if your own death is such a trivial thing? I’m not arguing against sacrifice — if it’s necessary — I’m just talking about perspective. More broadly, I think the quest for total selflessness can lead to a peculiar selfishness of its own. Expecting total virtue from yourself, martyring yourself for the common good, still places you on a sort of pedestal in your own mind. It often feels like people who just help others, without going on some quixotic quest to eradicate their own selfishness, end up doing a lot more good. I was also struck by the part about not focusing excessively on books, philosophy, and the arts. I’m a book guy, obviously. I love stories, whether on paper or on a screen. I tend to think of good stories as noble in their own right — and I still do think that. But I also know I have a tendency to get mired in fantasy worlds, to dwell on the characters and plots of TV shows and movies and novels so much that it distracts from real life, and dilutes the power of the stories, too. Even reading the news can become a kind of fantasy if it moves past understanding the world and into escaping the world. Over the past few days, because of this book, I’ve been trying to focus more on what I really need to do, and on not getting mired in fantasies. And I’ve noticed a difference in my life already. I’m getting more done, I’m reaching more of my goals, and I’m happier because of it. I know from experience that such life changes don’t last — at least, not in a clean, unbroken line. My life has been an endless series of cycles: up and down, productive and unproductive, happy and unhappy, disciplined and undisciplined. This will be another, and it will end. But I’ve been thinking about those cycles, too. If I can keep in mind that the changes are cyclical, I think that’s an improvement in itself. When I’m “up,” it will remind me to be vigilant, to watch out for whatever might start a downward spiral, and try to avoid it. When I’m “down,” it will remind me that it’s temporary, and not to get too upset about it — I just need to look for the next chance to start upward again, and maybe that chance is right away. Anyway. Meditations is a weird old book, and it has some problems, but it’s short and thought-provoking and maybe worth a read if you’re into that kind of thing. Or not. You’re busy already. Instead of reading a book that says “Do the thing” — maybe just do the thing! I had a long dry spell — over nine months — where I didn’t read a single book from start to finish. I was still reading, of course: I started some books without finishing them, I read a lot of stuff online, I read 27 volumes of manga (Claymore — pretty good), and I read some books of the Bible (which I don’t consider “books” in the normal sense). Still, I’m glad I finally broke that bookless streak. 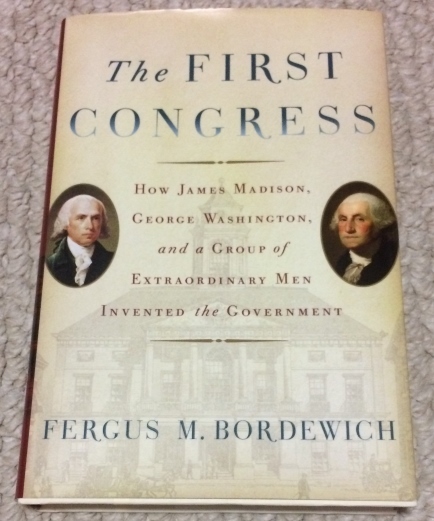 The First Congress, by Fergus M. Bordewich, gives a great insight into how the U.S. government really formed. In school, you learn about the Declaration of Independence, the Revolution, the Constitution … and then early U.S. history, like the Louisiana Purchase, Lewis & Clark, and the War of 1812. That’s all fine, but it does skip a very important step, something I’d rarely thought about before: How did we get from a piece of paper (the Constitution) to an actual, functioning government? Picture it: The year is 1789. The Constitution’s just been ratified, replacing the weak-sauce Articles of Confederation. The United States are finally united, at least in theory — all eleven of them (North Carolina and Rhode Island haven’t accepted the Constitution or statehood yet). The first president, the universally beloved George Washington, arrives in New York City (the nation’s temporary capital). Congress arrives too — the House of Representatives has 65 congressmen, and the Senate has 22 (although it takes a while for all of them to show up). You’ve got a quorum, you’ve got public support and goodwill, you’ve got this fabulous piece of paper. What you don’t have is any federal government whatsoever, apart from yourselves. Your country is militarily weak, massively in debt, full of internal divisions, and not generally expected to survive. You have few resources, no federal laws, no precedents, and no judicial branch whatsoever at the federal level. You need to build an entire government from scratch, following a structure that’s never been tried before. And you need to do it right now. It’s crazy, isn’t it? But The First Congress takes you to the center of the craziness and makes you feel like you’re really there. The author gives lots of quotes from everyone involved, letting you hear what happened in their own words. He shows the issues from all sides. What’s more, he offers all sorts of details on how life was back then, from food to newspapers to public sanitation. The first Congress and the current Congress have a lot in common. Partisan gridlock, pettiness, and scandal are nothing new. We worry about gerrymandering (and rightly so), but the first Congress included the original gerrymander-er, Elbridge Gerry himself. The bickering and infighting over where to place the nation’s permanent capital went on for a staggering length of time. For me, this insight inspires hope rather than cynicism, because it means we’ve conquered these obstacles before and we can do it again. The Founding Fathers were just human beings. They were great humans who did great things, but they were all deeply flawed as well, in a variety of different ways. You often see some quote attributed to Jefferson or Madison, as if that alone makes it true — but Jefferson and Madison were both wrong (and naive) about all sorts of things. Moreover, the Founders disagreed and argued constantly among themselves. That isn’t a criticism, just a reminder that the oft-cited “what the Founders intended” was often not any single thing. This whole states’-rights-versus-federal-power debate has raged from the very beginning. What does the Constitution really mean? Simply put, nobody knows, and nobody knew back then, either. (Of course, that’s not to say that all interpretations are equally valid.) In many ways, we actually have better insight into the Constitution today, because we have the benefit of learning from past mistakes. Alexander Hamilton is severely underrated, the musical notwithstanding. As a kid, I wondered why he was on the $10 bill when he wasn’t even a president. It turns out that, in addition to living an utterly fascinating life, Hamilton was a crazy-smart economics geek at a time when “economics” was kind of a new thing. He built the U.S. financial system virtually from scratch, using debt in brilliant (and mostly ethical) ways to build up American credit at a time when a huge number of Americans regarded debt as inherently evil. And it worked. Nothing is simple, especially in history. If someone tells you otherwise, tread carefully. That’s all for today. Have an outstanding weekend! Imagine, if you will, a film starring Michael J. Fox. Co-starring Leonard Nimoy and Claudia Christian (Ivanova, for you Babylon 5 fans). Featuring linguistic work by Marc Okrand (the guy who created the Klingon language). Co-written by Joss Whedon. Animated by Disney, with a healthy dose of CG. And available on Netflix to boot. Would Brian be interested in such a film? Yes, Brian would. And Brian (who apparently is speaking in the third person now?) watched it with Betsy on Saturday. So first of all: yep, it’s good. Apparently Whedon didn’t have a whole lot to do with it (there are five other co-writers, and I’m told his contribution ended up being minimal) but I daresay it still has a bit of a Whedon-ish vibe. Weird fantasy stuff? Check. Funnier than most sitcoms? Check. Girl with crazy/scary superpowers? Check. Lots and lots of death? El checko. Nimoy’s voice acting as the king of Atlantis is great, but I loved hearing Claudia Christian even more. That’s partly because her character (blond on the right, above) doesn’t just sound like Ivanova from B5, she basically is Ivanova. Brave first officer on a dangerous mission, deeply sarcastic, the whole deal. Maybe a bit ethically challenged, but hey, they’ve gotta keep it fun. Okay, I’ve rambled a lot about who is in the movie. But what’s it about? To be honest, the plot isn’t super riveting. Ancient empire beneath the waves, plucky adventurer(s), exotic princess, a touch of genocide, glowy crystal magic, climactic battle — it’s all good stuff, but the dots connect in more-or-less typical Disney fashion. Where Atlantis shines is in the execution. Visually, it’s beautiful, as I hope the screenshots convey. From the very first scene, Atlantis uses traditional animation and computer graphics in tandem, to powerful effect. Sometimes the character movements are a little over-the-top (a trait the film shares with Titan A.E., among others) but mostly it’s great. The dialogue is top-notch too. The characters don’t just talk to move the plot along — they talk because they’re people who have something to say. In terms of making the movie come alive, everything basically clicks. So is Atlantis the perfect movie? I remember thinking, about halfway through, that it actually kinda was. But the second half stumbled a bit IMO. Not any single thing, really — but the big “surprise” was obvious long in advance, and the pieces never quite came together in a really satisfying way. And even though the characters were vivid and realistic, I never fully connected with them. Not exactly sure why. Part of it may have been that there were just too many, so most of them — the princess especially — didn’t get enough screen time to really develop. Words of wisdom for us all. Yesterday I was sick and ended up with a whole day home alone (quite a rarity in this phase of my life). I watched two movies I’d been wanting to see for a long time: Kubo and the Two Strings and Interstellar. Kubo is animated, ostensibly a kids’ movie, full of bright colors, Asian-themed, bouncing with energy, heavy on fantasy and magic, while Interstellar is very adult, bleak and somber, America-centric, slow-paced, heavy on sci fi. Very different films. But also a lot of similarities. Both revolve around the parent/child bond; both have a lot of darkness; both are visually stunning; both have a twist at the end that redefines everything that’s come before, inviting a re-watch; both, strangely, star Matthew McConaughey (he’s the voice of Beetle in Kubo); both got fairly good Rotten Tomatoes scores (Kubo 97%, Interstellar 71%); both have more heart than brains; and both, ultimately, left me a little disappointed. Let’s start with Kubo and the Two Strings. Kubo is a kid with one eye. He lives with his mom. She warns him not to stay out past nightfall, or else his evil supernatural aunts and his evil grandfather the Moon King will steal his other eye. (Ahem. You have my attention.) Of course he does, and the baddies chase him (with grappling hooks! ), and a lot of stuff happens but he ends up going on a quest with a monkey and a human-sized beetle samurai thing. (The “two strings” of the title refer to his musical instrument, which has a variety of magical powers and comes to symbolize his family.) It’s probably not a spoiler to say that he triumphs in the end. Kubo has magic of his own, which largely involves paper-folding (origami), and that’s cool to watch. The music is great too. And the story is pretty solid. In theory, it seems like an amazing movie. One problem, for me, is that nearly all the dialogue is just … a little bit … off. It’s a subtle but persistent feeling that’s hard to describe. The rhythm of conversation, the timing, the flow, isn’t quite right. Pauses are just a bit too long, or something. It feels like the story is trying to move a tiny bit faster than the conversation, and it can’t. Legend of Korra had this same problem and it drove me bonkers. I doubt this will bother many other people, though. Another problem: The way the story unfolds feels haphazard and arbitrary in a lot of places. Kubo and most of his family (good and evil alike) have magical powers of one kind or another, and the magic seems like it can do … well, whatever the story needs for that scene. Likewise, we move from one strange location to another without an overall sense of direction. It’s a problem because, the more arbitrary the story’s path becomes, the less the characters’ choices matter, and character choices are the heart of a story. This story is set in a dystopian, not-so-distant future, where we have (somehow) run out of food and (for some reason) cast aside technical knowledge, instead refocusing ourselves on traditional farming. It doesn’t make a lot of sense, but it’s a compelling premise: McConaughey plays Cooper, a pilot-turned-farmer who is raising his son Tom and his daughter Murphy on a dying planet, and yearning to use his engineering know-how to save the human race, and his kids in particular. The plot gets complicated — this is a Christopher Nolan movie, after all — so I’ll just say that Cooper has to leave his daughter Murphy behind to fly this long-shot interstellar mission, and everything he does out there is really all about getting back to her. It’s also harrowing to watch. The formula for an emotional gut-punch is (deceptively) simple: Just forge a bond of unfathomable love between two people, and then stretch that bond until it screams, and then stretch it some more. Interstellar does this repeatedly with devastating power, with Cooper and his daughter, and it never feels cheap. One scene in particular gave me a new appreciation for McConaughey’s acting abilities. So there’s a lot to like. But also a number of problems. For starters, as I said, it’s long — almost three hours — and it feels long. I definitely think some parts could’ve been cut. It also gets into a lot of weird semi-philosophical semi-scientific mumbo jumbo near the end, and the further they drifted into that, the less interested I got. I don’t mind a complicated movie, but it has to feel like a puzzle worth unraveling, and this wasn’t really it. These two problems are linked, and they were probably the biggest obstacle to enjoyment for me. About the scientific accuracy of the movie — I guess I need to do some more thinking. Last night I subjected my poor wife to a rant about how bad the science was, but today I’m reading about how accurate it is, how painstaking the research was. So I may need to brush up on my own knowledge of relativity and see if some of my criticisms were wrong. None of that matters too much to the story, but I’m a science guy, so I’m interested (and apparently Nolan is interested too). In summary: I wasn’t really impressed with either movie overall, but both were very impressive in certain particular ways, and both were clearly made with a lot of love. Also, I’m pretty weird, and a lot of my criticisms are things that won’t bother anyone else. See how helpful I am? In our latest installment of Brian Finally Gets Around to Watching Stuff that Everyone Else Watched Ages Ago, we look at: Wonder Woman! WW is a very good movie that is fun to watch, but also frustrating, because it could’ve been a great movie with some fairly minor changes. We’ll start with the good stuff. The strength of WW is its characters. 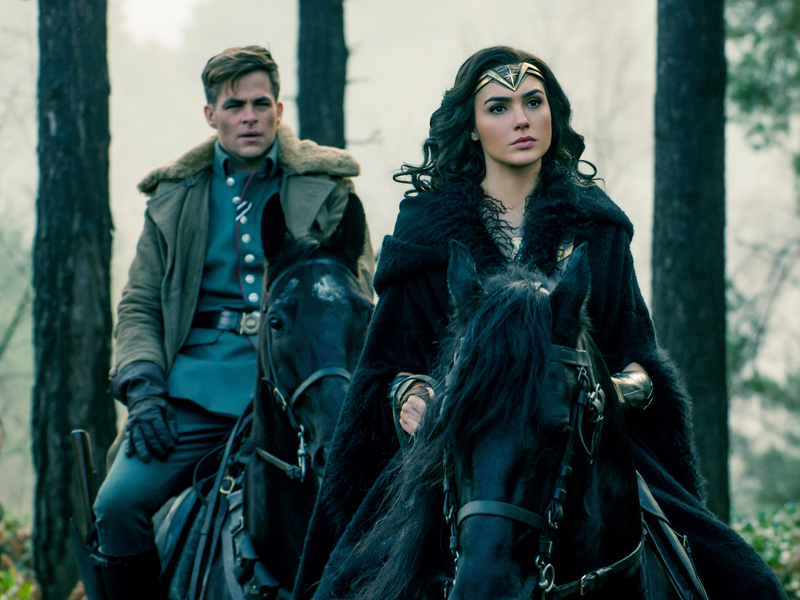 Wonder Woman herself (who in the movie is thankfully just called by her name, Diana) has spent her whole life among the all-female Amazon warriors on a remote island, cut off from the rest of civilization, and has no idea that the whole planet is caught in the throes of the Great War (i.e., World War I). She is strong and brave and virtuous, but heartbreakingly naive, which puts her in constant tension with the modern world. All this is executed brilliantly. Steve Trevor (who I mentally called “Captain Kirk” throughout the movie) is her opposite in many ways. Weary of fighting, of watching those around him suffer and die year after year, he is a cog in the great war machine, and he knows it. He has no super powers. He doesn’t feel very righteous. But, like Diana, he is strong and brave, and he still wants to make a difference. Whether in the streets of London or on the front lines, they’re perfect together. Each of them would be lost without the other. Their dialogue has energy and conviction, and it’s genuinely funny when it’s trying to be. (WW has more humor overall than you might expect.) Their romantic chemistry is both believable and understated, which is a breath of fresh air compared to, say, Tobey Maguire and Kirsten Dunst in Spider-Man (not that I blame the actors; they did the best they could with the lines they were given). Kirk’s Trevor’s ragtag band of misfits are surprisingly human and likable too. Each has a backstory that is touched on briefly, rather than hammered in; each is broken in his own way; each, in his own way, has turned his brokenness into strength. In many films, sidekick characters like these would be written, dully, as stock tropes: Crazy Guy, Ethnic Guy, and Ammunition Guy (or whatever). It’s a measure of WW‘s quality that the writers went deeper. At the heart of the story is a philosophical question: Do humans fight wars because their pure hearts have been corrupted (as Diana believes) by Ares, the god of war? Or do we fight because (as Trevor believes) we were never pure to begin with? The film revisits this question, quietly but persistently, throughout. When Ares is finally revealed at the end, his true nature is more interesting and subtle than either of those two worldviews might suggest. One more thing: There are some movies and shows whose approach to feminism is roughly, “Look! It’s a woman! She’s a hero! She’s doing hero things that are traditionally male! Did you see that she’s a woman? A woman hero! Did you catch that? Girl Power! Instead of a plot!” Thankfully, WW avoids this trap. Like Buffy before it, WW makes feminism a central theme of an excellent story, rather than putting a veneer of story over a Feminist Message™. So that was a good thing. But, as I said, WW does have some problems. For starters, the beginning … is … really … really … REALLY … slow. We spend 20-30 minutes just among the Amazons, and it’s pretty much all backstory. 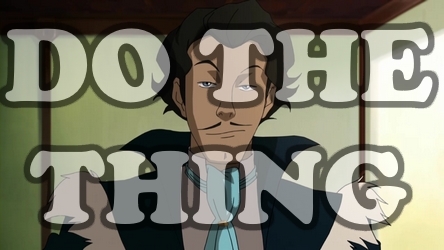 There’s no significant conflict, just some tired tropes that are very predictable and very boring. (Will the young girl end up with kickass hero superpowers, or not?! I’m on the edge of my seat.) A story without conflict isn’t much of a story. Things don’t actually get going until Trevor shows up, and the movie should’ve started there, or else given the Amazons something more interesting to do. The ending is kinda tiresome too. When Ares is first revealed, it’s awesome, because he’s this quiet, unassuming little man, somebody you’d never expect to be the god of war, but who — in retrospect — is perfect for the role. Unfortunately, and inexplicably, the movie then throws away all that subtlety, puts Ares in a massive suit of armor, and makes him fly around shouting idiotic cliches. Incidentally, the key to defeating the living incarnation of conflict turns out to be, um, battling him to the death. So there’s that. The other villains are a bit on the dull side too. There’s this sadistic lady who invents a new, super-deadly poison gas, and there’s a general who likes killing and poison gas and gets some minor super powers that don’t really accomplish much. They’re both Germans (of course), and they’re both pretty flat comic-book villains. I mean, I know it’s a comic-book story, but still. Also, there are a whole lot of things in WW that don’t make any sense. This is true of pretty much all superhero movies, so I’m not picking on WW in particular, but they’re still annoying. Stuff like: Why do all the Amazons speak such good modern English, when they all learned it ages ago? (Why does Diana know the English word hydrogen when she’s translating from Sumerian? For that matter, why is there a Sumerian word for hydrogen?) If Diana’s mother is so obsessed with Diana’s safety, why does she let her go to the Great War without even considering giving her any Amazon backup? Why does Ares forget how to teleport as soon as he starts fighting her? How come nobody at the party notices that Diana has a sword lodged in her dress? Why does Diana, a trained warrior, walk around carrying her sword with the blade up by her face? And so on. Again, these are all relatively minor, but they don’t help the suspension of disbelief. One scene in particular sticks out. Diana comes to the trenches for the first time, along with Kirk Trevor and the others. Trevor is explaining that nobody can cross the “no-man’s land” between the trenches because both sides have machine guns. Diana, brave and hopeful, ignores his warning, leaps out of the trench, and charges the German side, deflecting bullets with her bracelets (wrist armor?) and then repelling sustained machine-gun fire with her shield. This “distraction” gives Trevor and his men the chance to charge the enemy as well, and together they lead an attack that is ultimately successful. The scene is memorable because it’s (1) incredibly cool, both on a visual level and a story/character level, and (2) completely ridiculous. Diana, who is just as vulnerable to gunfire as any human, has no covering at all over her arms or legs, and her shield is only big enough to protect her torso, yet somehow, a dozen or more soldiers with all manner of weapons firing from multiple angles can’t seem to land a single shot to her limbs. I know, I know, it’s just a movie, but the over-the-top absurdity does kinda undercut Diana’s whole you-can-succeed-if-you’re-brave-enough mentality. On a more philosophical level: Diana seems to have no problem with killing humans, which is a bit jarring after seeing so many heroes from all different universes who so viscerally oppose it (e.g., Superman, Batman, Buffy, Aang). That’s not a criticism in itself. However, neither Diana nor the filmmakers seem to notice the hypocrisy in her position: That poor, weak-hearted humans fight wars because Ares corrupted them, whereas noble, strong-hearted Amazons fight wars because it’s the right thing to do. By the end of the movie, she’s decided to embrace a philosophy of love, but seemingly doesn’t even reflect on the many German soldiers she’s killed (most of whom would’ve given anything to escape the misery of the trenches). This values dissonance, like my other criticisms, is hardly unique to WW, but in an otherwise excellent movie, it stands out all the more. Oh yeah, and one other thing. There are a lot of slow-mo action shots. I mean a lot. And that’s coming from someone who liked the Matrix sequels. So, wow, I’ve rambled a lot. In summary: If you’re at all interested in Wonder Woman, you should go check it out. It’s probably the best DC movie I’ve seen, apart from The Dark Knight. And if you do see it, let me know what you think! But despite all I’d seen and heard about this patriarch of horror, I had never actually sat down and read the original source text: “The Call of Cthulhu,” a story by H. P. Lovecraft, published in 1928. So when I stumbled across the volume above at a local Books-a-Million — overpriced, but bargain-discounted to a more palatable cost — I had to have it. The story itself is remarkably short, for how influential it’s become — just twenty pages in my copy. The complete text is available here, if you like. There’s little plot to speak of. An eminently forgettable narrator does some digging into some old papers, talks to some people, etc., and learns about Cthulhu. What he finds is Truly Horrifying™. Cthulhu is a cosmic, horrific, ancient being that came to Earth long ago. He sleeps beneath the waves, but one day he will wake and bring madness to the whole world. Also, he has a cult. That’s basically it. 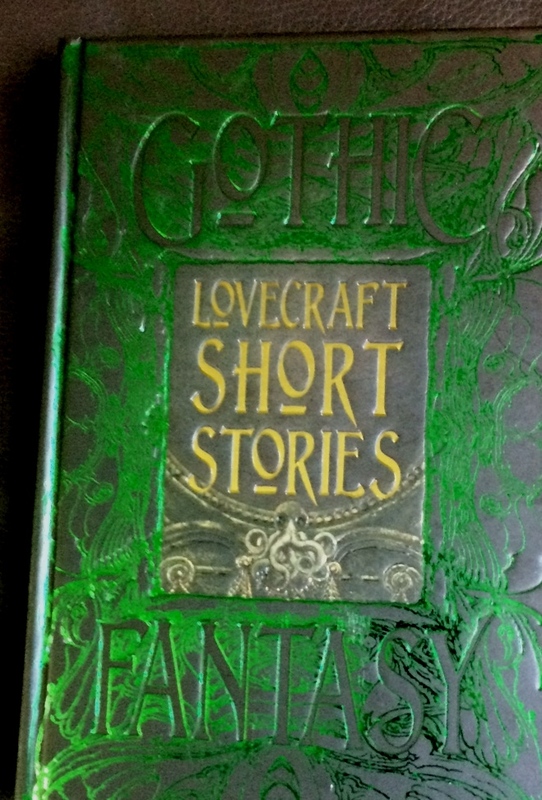 I’ve read a little other Lovecraft before: the novella At the Mountains of Madness, a long essay about horror writing, and some small story whose name I’ve forgotten. So, how does “The Call” compare? Well, it’s the best of his fiction so far, and it’s sort of a fun little read. But it’s still Lovecraft, and his horror is all starting to run together for me, virtues and flaws alike. Lovecraft’s main virtue is this singular vision he has, that the day-to-day world we know — comfortable, or at least familiar, with our human ambitions and worries and notions of good and evil — is just an infinitesimal speck in the belly of a universe dark and vast and ancient beyond imagination. That much, at least, is simple scientific fact, but Lovecraft gives the darkness force and personality in the form of the Great Old Ones — beings, like Cthulhu, that are so old and strong and strange that we literally cannot imagine their true nature. Even the names we use for them are just feeble human approximations. They are not so much evil, in the mustache-twirling sense, as simply other, utterly indifferent to our desires. Amoral, rather than immoral — and the former is far worse, at least for Lovecraft. This is a compelling vision, not least because it feels powerfully real. We don’t actually believe in squid-headed mile-high monstrosities, but we do sense that the universe is far darker, deeper, and stranger than our human-centric views might suggest. It’s that particular brand of unfathomable weirdness that survives today as the core of his legacy, and that makes “The Call” enjoyable. The problem, though, is that Lovecraft is a little too focused on his vision. He hammers it into you endlessly, with every paragraph, every sentence. He is forever insisting that his darkness is so dark, so ancient, so strange, so far beyond mortal comprehension, that you just want him to take a breath and maybe have a beer or something. Certain words pop up over and over: unhallowed, nameless, strange, aeons, Cyclopean (which means “enormous,” only bigger). So many people are driven mad that you start to wonder if they just need better psychiatrists. Every writer hears the advice “show, don’t tell,” and Lovecraft desperately needs this remedy. You don’t convey horror by saying that something is horrible, or dark, or twisted. You’ve gotta give details, and let the reader’s brain supply the horror on its own. Lovecraft does give details, but he doesn’t let them stand on their own, and honestly the details he gives aren’t super horrifying, especially compared to the over-the-top reactions they induce in all his characters. That’s another thing. Nobody in a Lovecraft story can hear or see anything remotely connected to the Great Old Ones and just blow it off. “Pfft, squid-head statue, whatever. Did you hear what Stacy said that Molly told Howard about Mike’s promotion?” It’s always shuddering, shivering, whispering. Everyone in this world is as impressed by the mythos as the author himself. And the experts (archaeologists, biologists, linguists) are always baffled by any Cthulhu-related artifacts they find. It’s like nothing they’ve ever seen. Really? You’re telling me a room full of scientists, all trying to impress each other, can’t come up with any connection, even superficially, to anything they know? Lovecraft is trying too hard. Above all, Lovecraft’s fiction is rife with purple prose. In one passage, he says a statue of Cthulhu “squatted evilly,” which is fun to try and visualize. Elsewhere he speaks of “unhallowed blasphemies” (as opposed to the hallowed kind?) and describes something “visibly darkening the sun” (a contrast to all that invisible darkening you hear about). Everyone listened, and everyone was listening still when It lumbered slobberingly into sight and gropingly squeezed Its gelatinous green immensity through the black doorway into the tainted outside air of that poison city of madness. Now you know why Hemingway was so sparing with adverbs — Lovecraft took them all. All criticism aside, though, Lovecraft’s dark-purple prose is fairly enjoyable in small doses — which is one reason that the twenty-page “Call of Cthulhu” is much better than the much longer At the Mountains of Madness. So if you’re curious about the origins of our tentacled, occasionally plush friend, this story is a fun way to spend an hour or two. For a man who died in 1973, John Ronald Reuel Tolkien still gets an awful lot of books published: The Silmarillion, 1977; the twelve-volume History of Middle-Earth in the 80s and 90s; The Children of Húrin, 2007; and others. All this is possible because one of his sons, Christopher Tolkien, has devoted a remarkable amount of time and energy over the decades to combing the elder Tolkien’s voluminous notes, sketches, and drafts, which are often incomplete and hard to decipher. Christopher is 92 today, and still going. 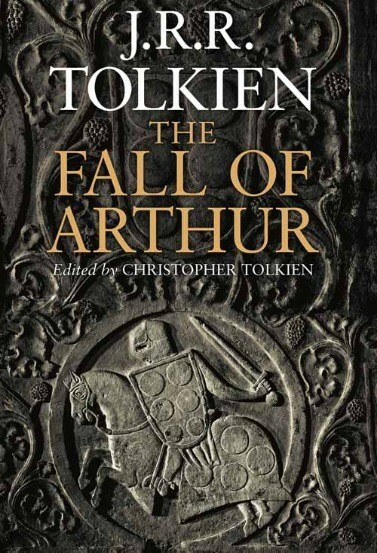 A few years ago he came out with The Fall of Arthur. A few weeks ago I discovered it in a local bookstore. A few days ago I finished it. And it’s excellent. flowing down afar from fells of ice. That space in the middle of each line is part of the Beowulf form, too. When discussing it, Tolkien speaks of both lines and “half-lines.” The purpose of the half-lines would require a whole separate blog post (and more research on my part), but the Wiki page I linked above has some explanation. More remarkable, from my perspective, is that this is really good poetry. I grew up on The Hobbit and Lord of the Rings, and I thought the poetry and songs in those books was amazing — but the older I got, the less impressed I was. So I wasn’t sure what to expect here. But his use of language is just beautiful. I think the Old English form (as opposed to the more conventional rhyming verses he uses elsewhere) pushes him to find more interesting word choices. I also love all the old words he uses, which make the poem as a whole feel both ancient and truly connected with Arthur’s world. In the quote above, “fells” are hills or heights — so “fells of ice” are hills of ice. Elsewhere, he uses “tarn,” which is a small steep-banked mountain lake. (Incidentally, “tarn” appears in the first paragraph of The Fall of the House of Usher as well.) Other examples abound. I’ve gotta say, too, it’s refreshing to read a serious work by Tolkien that isn’t in Middle-earth. I like hobbits as much as the next guy, but sometimes I also like, y’know, not hobbits. So that was cool. The Poem in Arthurian Tradition — Which sources did Tolkien draw on for his story? The Arthur mythology doesn’t have a single canonical source. It’s a jumble of different authors and traditions and languages over a span of centuries, with some altering or expanding on earlier works, and some inventing completely new stories. Christopher offers a solid historical context for the mythology his father decided to use. of the Bay of Faery on the borders of the world. Even putting aside the Arthurian connection via Avalon, the lines above are gorgeous poetry, in my opinion — the word choice isn’t as sophisticated as what you’ll find in The Fall of Arthur, but it’s a vivid image nonetheless. The Evolution of the Poem — Christopher had access to earlier drafts of the main poem, and he uses them to show how his father’s ideas grew and changed over the course of multiple revisions. 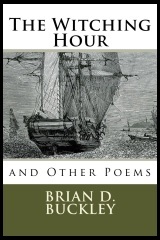 He presents this evolution in considerable detail, taking a full 50 pages — which is longer than the poem itself. I confess this is the only section of the book I was unable to finish. I love writing, and editing, and revision, and poetry, and textual analysis, and Tolkien, and King Arthur, but even so, there’s only so much “See how he added five lines here?” that I can stomach. Nevertheless, it’s a great resource for anyone doing serious research, and its inclusion demonstrates once again Christopher’s dedication to his father’s work. There’s also an appendix, an essay, where J. R. R. Tolkien explains in his own words what alliterative verse is all about, and explains the Old English verse tradition more generally. I found it fascinating, but I fear I may be in the minority there. Whew! I always start these postmortems intending them to be just a few words about the book or movie or whatever, and I always end up being reminded yet again that writing “a few words” is beyond my abilities. But that’s how it goes.